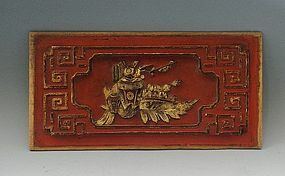 A red panel with gold hi-lights from a piece of Chinese furniture. The carving depicting 2 scholar's vases with flowers and leaves is excellent and it would be a welcome addition to any decor. Over 100 years old and measuring 11.25" by 6", our clients often hang these above paintings. More photos available upon request. 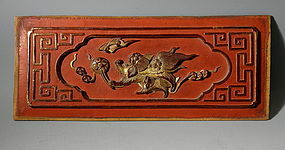 A red panel with gold gilt featuring an extremely well carved foo dog and her pup playing with the celestial ball. Two bats are flying overhead signifying good fortune. The coins along the ribbon represent prosperity. This lovely panel is in excellent antique condition and would be a welcome addition to any decor. Over 100 years old and measuring 14" by 6", our clients often hang these above paintings. More photos available upon request. How cool is this? 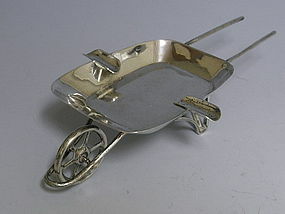 A sterling silver, marked Mexico 925, wheelbarrow. 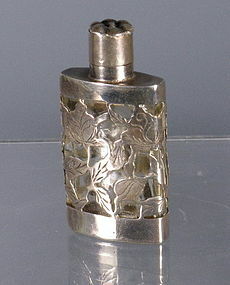 Designed as an ashtray, we think it would also make a terrific condiment or candy dish. Small serving spoons could set where a cigarette would normally rest. It is the perfect size, measuring 8" by 4.25. 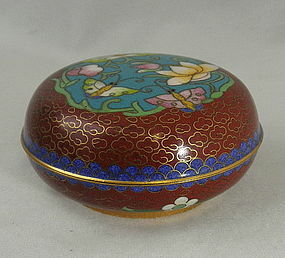 A charming round cloisonne box with butterflies and flowers. 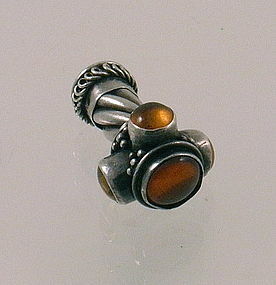 It is in perfect condition and would make a lovely gift in which to put a piece of jewelry or other small treasures. 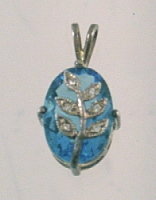 Inside the box is a rich turquoise enamel. More photos upon request. 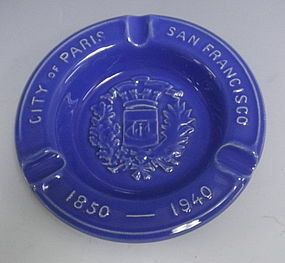 Measures 3" in diameter and 2" high. A highly collectible Victorian lead caterpillar. 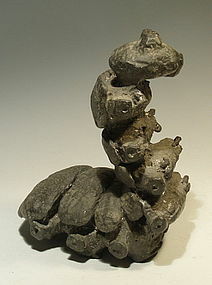 Unusual lead figurines were collected during Victorian times. 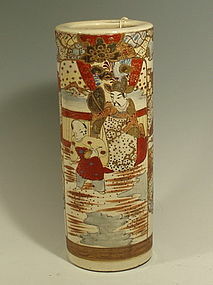 These larger pieces are quite rare and though not intended to be a door stop it is certainly heavy enough to be one. Measures about 12" high. This useful vintage ivory Fire King hotplate server was designed to protect you table from oven hot casserole dishes. A hot casserole dish can go straight from the oven onto this trivet. 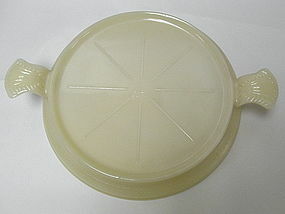 The handles offer the ideal way of moving your hot dish as well. From handle to handle it measures 10 1/4", inner diameter for a pot is 6 3/4". In excellent condition. 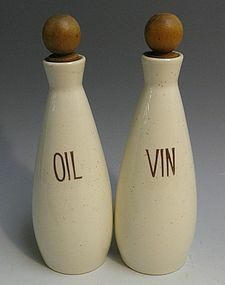 Vernon Kilns oil and vinegar set. 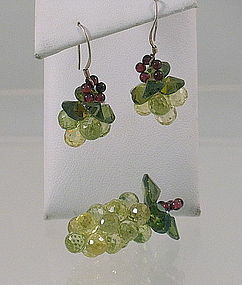 Hard to find, it is marked VERNONWARE MADE IN USA. Measures 7.5" high. In excellent condition. 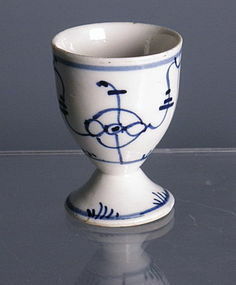 A blue and white hand painted eggcup in a blue onion pattern. 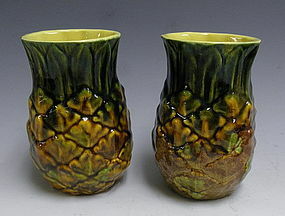 The foot is hand cut and is the inside bottom glazed and marked "Made In Germany" in green. Measure 2.5" high. Dates between 1937-October 1949. 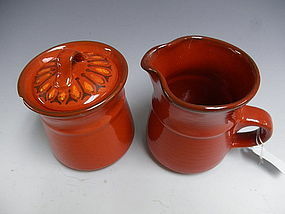 1970's Metlox Poppytrail red medallion creamer in perfect condition. We are selling just the creamer...the sugar with lid is included FREE. The sugar bowl has a noticeable chip on the underside of the lip which could be touched up with a permanent red magic marker. It's up to you. 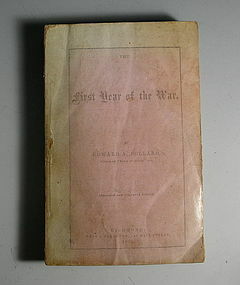 Published in 1862, this book is a record documenting the first year of the Civil War. Written by Edward A. Pollard, author of "Black Diamonds", this is the 2nd edition "Revised and Corrected". 406 pages of text, the book is paper bound. The back cover is detached, both front and back covers are faded due to age, all else excellent condition and a fascinating read.